Sixpence Play Shop | Great Little Trading Co. This is one of those toys that everybody loves and you'll always want to keep! 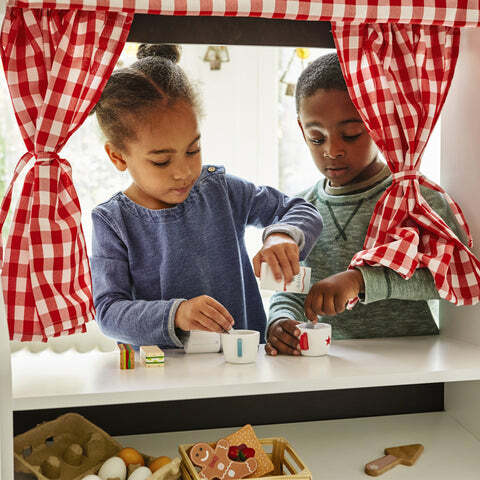 The familiar activity of shopping is great for encouraging pretend play and social awareness - it's ideal for sibling play or when friends come over. You can also spin it around to use it as a theatre; how about a puppet show or a Christmas concert? 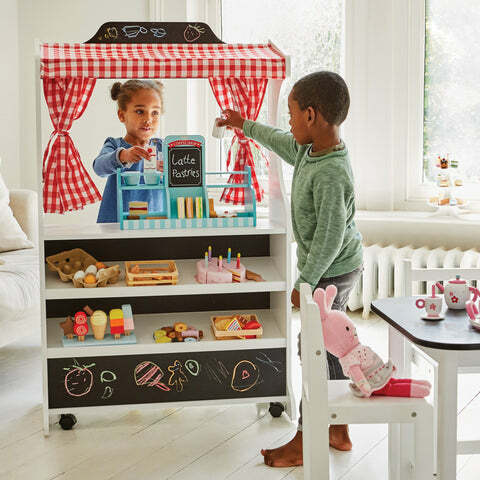 This fantastic wooden toy has won lots of prizes for its amazing play value and practical design: we love the useful storage cupboard, the display shelves, the blackboard sign, the curtains and the smooth running castors which mean you can wheel it out of the way when play time's over. Team up your Sixpence Play Shop with some of our Play Food, a toy till and the Shopping Trolley; if it's going to be in use as a play theatre you might like to have a look at our range of Hand Puppets.